Often, the only time redirects get brought up for a website is during a site migration, when a page is being retired or if a site is undergoing some URL structure changes. With this mindset, website owners often use the “set it and forget it” redirect approach and never think about how it could be affecting their site’s health and SEO value in the long-run. First of all, you need to know how and where your redirects are being managed. If your site has a developer, redirects are most likely being managed in the .htaccess file or a server config file depending on the type of server you’re using. If you’re not on the technical side or don’t have a developer on your team, you might be managing your site’s redirects from the backend of the CMS using a built-in redirect management system or using a plugin/extension, as is possible with many WordPress plugins. From my experience, both methods are often being used simultaneously when a company’s team is maintaining the site on their own, which can create a mess over time. Warning: Editing your Apache .htaccess file or Nginx config can break your site if not done correctly. If you don’t have experience with working in the .htaccess or server config, we highly recommend consulting your web host or developer first. With that being said, here’s a list of some redirect issues you might run into that could be negatively affecting your site’s SEO without you knowing it. A redirect chain is exactly what it sounds like: a series of redirects that go from one URL to another, until the final URL is reached. Quite often, redirect chains go unnoticed because we only see the end URL that we’re brought to in the browser. From an SEO point of view, this has an effect on diluting link authority. With every step in a redirect chain, about 10% of your authority is lost. Another thing to note is how much this can affect your site’s speed and server response time—having a single-step redirect will have an impact on your load time. Forcing users and search engines to run through multiple redirects just to call one URL can create a poor user experience and cause issues with crawling. Avoid chaining redirects. 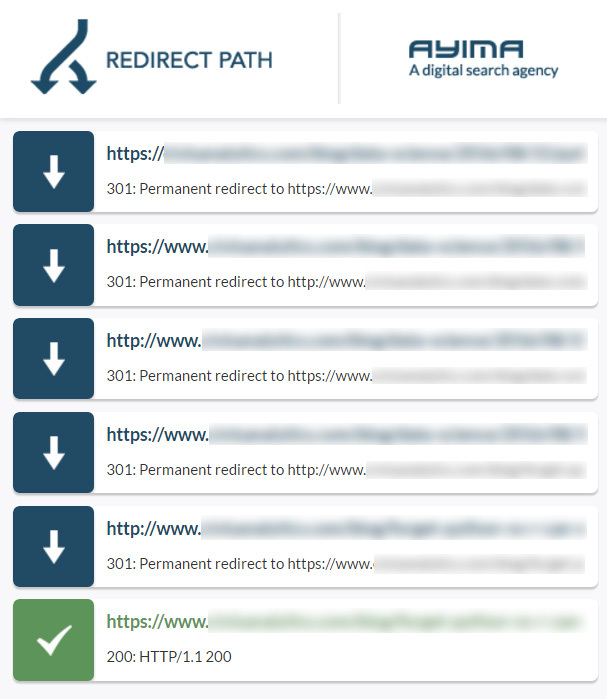 While Googlebot and browsers can follow a “chain” of multiple redirects (e.g., Page 1 > Page 2 > Page 3), we advise redirecting to the final destination (e.g., Page 1 > Page 2). If this is not possible, keep the number of redirects in the chain low, ideally no more than 3 and fewer than 5. 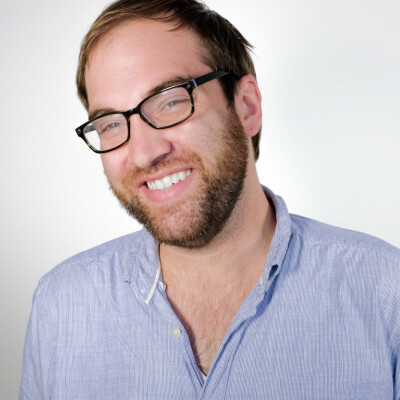 Chaining redirects adds latency for users, and not all browsers support long redirect chains. So how do you find out if you have redirect chains? 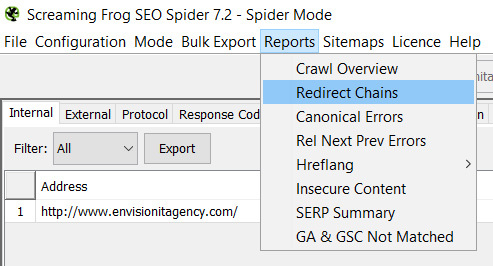 There are a lot of cool tools out there, but nothing works better than Redirect Chain Report from Screaming Frog’s SEO Spider Tool. Using the Always Follow Redirects option under the Advanced tab in Configuration>Spider helps you find issues with your redirects after you run a crawl. After your crawl is complete, you can then export your Redirect Chain Report by selecting Reports > Redirect Chains and start drilling through where you might have some issues. This isn’t just limited to site crawls either. You can even find issues with your older linked pages from your backlink profile. If you’re looking for a tool with good visuals for a better understanding of these chains, consider using Redirect Path. This tool allows you visually see the redirect behavior and QA URLs’ header responses. If your site has been around for a while, you likely have a lot of 301 redirects that have stacked up over the years. A lot of these 301 redirects provide authority that has built up over time and are necessary for keeping your traffic stable. When I’m referring to authority, in most cases I’m talking about links. Time and time again, I come across redirects that have become stale and don’t provide as much SEO value as they once did. This can include redirects that once had a specific purpose, like removing old site architecture from Google’s index or old vanity URLs that are not active anymore. If some of your redirects provide little to no value, you should consider cleaning these up because each time a URL is called by a browser, every single one of those redirects is checked to see if the requested URL needs to be sent elsewhere. This can have a serious effect on your load time and can often lead to users leaving your site. This can also be the cause of redirect chains as discussed above. After implementing a redirect, do you clean up all those occurrences of old URLs that were linked all across your site, or do you continue to allow them to 301 redirect? If you don’t clean up your interlinked 301 redirects, you might want to start. With mobile numbers growing and Google emphasizing site speed, users on mobile devices are expecting fast load times with every click. If a user clicks an internal link that ends up redirecting, it adds to their load time and could result in a bounce. And if 301 redirects are linked internally, it takes crawlers more time to get to the final page. This is a waste of your valuable crawl budget and means search engines will spend less time crawling and indexing live pages that you want them to crawl. You can easily find out how to clean all your internal links that are 301 redirects by running a crawl with Screaming Frog using the All Inlinks report under the Bulk Export menu. Sometimes canonical tags can be implemented manually or dynamically across certain content management systems that can cause issues for search engines. You don’t want to have canonical tags that point to URLs that are redirecting or aren’t reflecting the exact URL that you want to be in Google’s index. This will confuse search engine crawlers because this tag communicates with search engines which URL should rank for query results. To identify if you have any canonical tags pointing toward redirecting URLs, run a crawl using Screaming Frog, and select the Directives tab. With your table of URLs in front of you, scroll over to the right until you get to the Canonical Link Element 1. Select the list of these URLs from this column and paste them in a List Mode crawl. If you spot any 301s after your crawl is done, notify your SEO or developer of the changes that need to be made. If your site has gone through a few structure changes over the years, it likely has some authoritative links pointing to old URLs that return a 404 error. Using a backlink analysis tool like Open Site Explorer or Ahrefs, export your list of target URLs and drop those URLs in Screaming Frog by selecting Mode>List, clicking Upload, and selecting Paste or Enter Manually. After the crawl of your URLs is complete, take a look at the status column and start looking for URLs that might be returning a 404 status. Make sure to check the stats tied to the links using Ahrefs or Open Site Explorer and figure out if they provide any value. Note: If you’re using Ahrefs, you don’t even need to export your list of backlinks with their broken link report. If you don’t have any background in SEO or in understanding link metrics, get in touch with someone that does and ask them if the links provide any value. You can also check Google Analytics landing page reports to see if they have resulted in any traffic over the past year. As you can see, a lot of different redirect issues that are “under-the-hood” can happen over time and could possibly be hurting your SEO efforts (without you even knowing). The best way to combat these redirect issues is to set up an effective process for mapping redirects, retiring pages and cleaning up your site’s old URLs. If you are not comfortable diving in and understanding how your redirects behave, consult an SEO expert or a developer for some assistance.